Photos may not show all items included in the kit. Based on the details of the Diablo Highway crime scene, in this Firearms Identification Lab, students learn to identify the characteristics of the cartridges and bullets of fired ammunition and use this knowledge in the investigation of the crime. Kit includes everything to support a class of 30 students working in groups. For grades 7-12. To learn more, click on the tabs below. Clearly written, graphically-rich, easy-to-understand science lesson on fibers. Since their release in 2013, the Next Generation Science Standards (NGSS) have helped states and school districts in the U.S. to shape their expectations as to what students should know and do in science at various grade levels. The challenge for educators is how to present fun and engaging science lab activities that help their students achieve the objectives outlined in the NGSS. Diablo Highway: Firearms Identification is such a lab activity. Choose any of the options below to see how this lab activity aligns with the NGSS. To learn how Diablo Highway meets the standards in your state please contact us. Asking questions (for science) and defining problems (for engineering) – The essential question for students conducting the Diablo Highway: Firearms Identification Lab activity is Who committed the crime? In order to answer that question, the students must ask themselves: How can I determine who committed the crime? and then through a series of lessons and lab activities they learn the science, apply the science, gather and interpret data and come to a reasoned determination based on evidence. In Diablo Highway: Firearms Identification, the questions arise from the need to solve a problem. Developing and using models – One of the key models used by students in Diablo Highway: Firearms Identification is the crime scene map. All the evidence is mapped here which forms the basis for the student's investigation and their resulting determinations. According to the NGSS, a diagram is considered a model. This model can show relationships among variables. In a simple example, what is the relationship between a shot bullet cartridge that matches the firearms of one of the suspects and the location at the crime scene where it was found? Planning and carrying out investigations – There are four engaging lab activities in the Diablo Highway: Firearms Identification lab. Teachers can choose to have students work individually or in groups to encourage collaborative problem-solving. Analyzing and interpreting data – In all of the Diablo Highway labs, and in the Firearms Identification Lab in particular, students gather data in the course of their investigation, analyze and interpret them. This interpretation becomes the raw material in constructing the narrative of the crime and, ultimately, the arrival at a determination as to who may have committed this crime and how. Using mathematics and computational thinking – In the Diablo Highway Crime Scene Mapping Lab, (not included with the Firearms Identification Lab) students measure three-dimensional space and create an accurate model to represent this space. Constructing explanations (for science) and designing solutions (for engineering) – At the conclusion of the Diablo Highway: Firearms Identification lab, many teachers ask their students to write a report summarizing the results of their investigation including the evidence to support their determinations. Engaging in argument from evidence – Because the Frome murders on which Diablo Highway is based is an unsolved case, there is no “right answer” to the investigation that the students are lead to. They must choose the culprit and then support their conclusion – make their argument – based on the evidence they discovered and analyzed. It is quite common for students in the same class to credibly argue a case that points to different culprits. Obtaining, evaluating, and communicating information – In the Firearms Identification Lab, and throughout all nine of the lab activities in Diablo Highway, students evaluate the evidence from the crime scene, analyze this evidence in the lab and record this data. This data is compared with data from the control samples and a determination is made as to which control sample matches which piece of evidence, if any. In these ways outlined above, Diablo Highway supports the NGSS dimension in learning for Science and Engineering Practices. 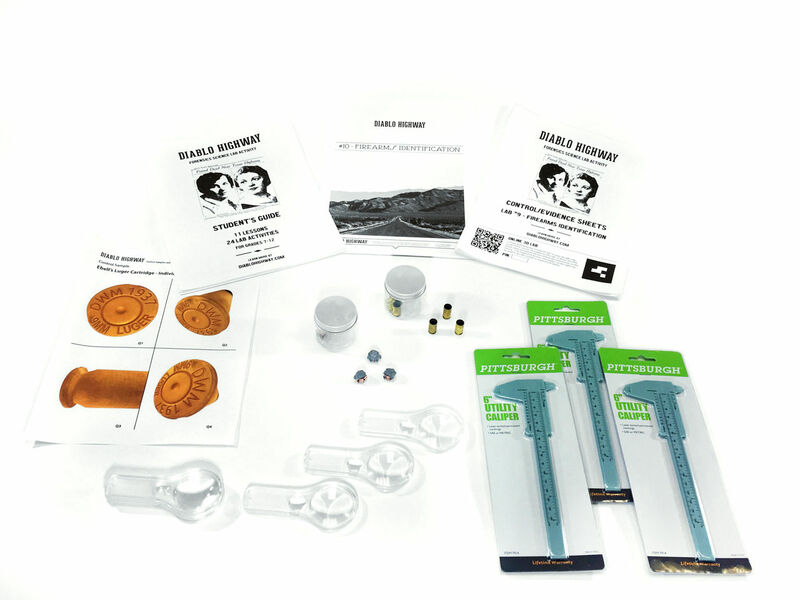 Being a Forensic Science Lab Activity, Diablo Highway is a also cross-curricular activity that features science and associated labs from a variety of science disciplines that traditionally have been treated as separate subjects - Physics (Firearms Identification), Chemistry (Blood Typing) and Life Sciences (DNA). Each of these disciplines come together in this activity supporting the NGSS goal of transcending the historical divisions of what were once separate subject areas. This gives students the opportunity to recognize the connection between them through the conduct of the lab activity. The students are also stretched to recognize a historical component to science. The students use the modern tools and techniques of forensics science and apply it to a case from long ago. DNA, for example, is an identification tool unknown at the time of the Frome murders upon which Diablo Highway is based, but is nevertheless applied here by the students as part of this activity. The NGSS Framework identifies seven crosscutting concepts that bridge disciplinary boundaries. Two of these crosscutting concepts in particular are strongly re-enforced in the Diablo Highway: Firearms Identification lab. Conducting these activities in the Diablo Highway: Firearms Identification lab enables students to address the next two questions outlined the the NGSS crosscutting concept of Cause and Effect: moving from How did that happen? toward What mechanisms caused that to happen? and What conditions were critical for that to happen? 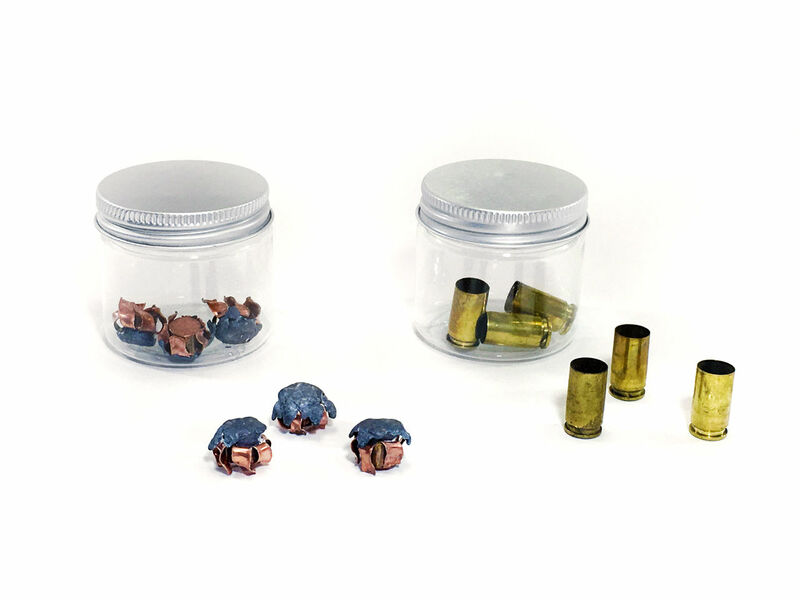 As specified in the NGSS, for students, the very act of carrying out an investigation, which is the central focus of the Diablo Highway: Firearms Identification lab activities, addresses the core of the crosscutting concept of Cause and Effect. 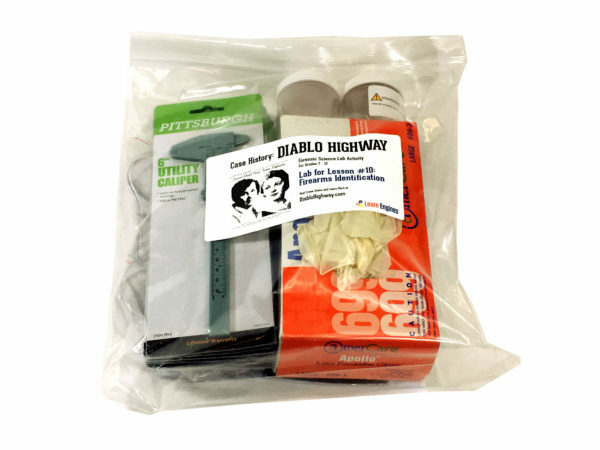 The Diablo Highway: Firearms Identification lab addresses this as well. In the culminating report, students present their case and supporting data. This compels them to argue from evidence when attributing firearms evidence to an owner. Further supporting the NGSS, solving this case helps students to understand that empirical evidence is required to differentiate between causation and correlation. It is made clear to the student, for example, that gun powder evidence found on one of the suspects, is a correlative connection but not a causative connection between that individual and the murder of the two victims. Additional corroborative evidence is necessary to prove causation. Diablo Highway students use a variety of methods in the lab activities. In the case of the Diablo Highway: Firearms Identification lab, these include observation, critical analysis, data recording and comparative analysis. In the Diablo Highway: Firearms Identification lab, students conduct close analyses and interpretation of data for the fiber evidence and the control samples and accurately record their findings. The students’ determinations as to whom a piece of evidence might be associated with and ultimately who may have committed the crime are based on and supported by evidence – not speculation. In short, students make and defend a claim based on evidence and thereby come to understand the difference between cause and correlation. If the initial analysis of some of the evidence is tending toward a determination, students are compelled to withhold final determination until all the evidence and control samples have been analyzed. Students use the map of the crime scene as the framework for the entire lab activity. As the evidence, analysis and determinations construct the narrative of the crime, it must be based cogently within the framework of this primary model. 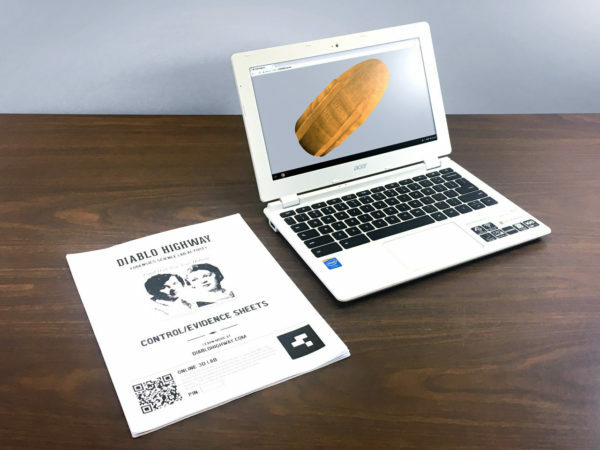 The determinations arrived at through the conduct of forensic science forms a narrative, an explanation, of the phenomenon that had occurred – the unnatural death of Hazel and Nancy Frome. 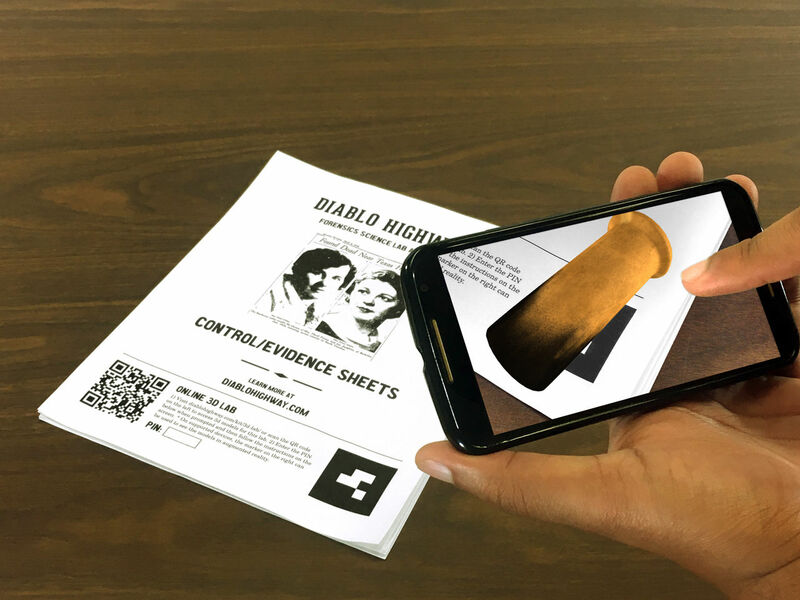 Using the modern tools and techniques of today’s forensic scientists, students compare their findings with other class members and with the professional investigators who worked the case in the 1930s. The forensic science labs conducted by students during this investigation reinforces this notion of an order and consistency in natural systems. Students learn for example that the rifling pattern on the barrel of a firearm will consistently impress that pattern on a bullet as it speeds through the barrel. What is particularly beneficial about Diablo Highway is that the notion that science is a human endeavor put to the task of human betterment is strongly re-enforced. Here, science can help determine the perpetrators of an horrific act of violence against two innocent human beings. Teachers are encouraged to have students and/or student/groups share their approaches and their findings with the other members of their class. Students do so with written, oral and video presentations. The two primary questions posed by the Diablo Highway lab activity are: How did this happen? and Who did it? In answering these questions, students properly learn and apply science. In Diablo Highway, the initiating phenomenon is death or, more specifically, a sudden or unnatural death – one that shortens the expected natural lifetime of an individual. This is a suitable phenomenon in the NGSS framework because the anchoring phenomenon is understandable prior to the investigation. Hazel and Nancy Frome did die, this is clear, but the students must further investigate to discover how, why and by whom. The students do so in an ordered, step-by-step process to determine how this phenomenon occurred. Anchored as it is in this real event, Diablo Highway helps move students away from what the NGSS calls “decontextualized knowledge that students are unable to apply” in other applications. Rather Diablo Highway helps students “build more usable and generative knowledge” - problem-solving techniques that can be applied to other in-depth investigations. The investigation and explanation of an unnatural death and the solving of the crime that caused it is certainly a compelling phenomena that, as it says in the NGSS guidelines, “students find interesting, relevant and consequential” to support their engagement. Because the case of Hazel and Nancy Frome is a real case from history involving actual people and an actual place - this makes it all the more compelling for the students. This becomes the anchoring phenomenon which is followed and closely supported by investigative phenomenon throughout the Diablo Highway lab activities. In these ways and others, Diablo Highway strongly encourages the learning and application of science because it is grounded in phenomenon. Diablo Highway also strongly supports the notion of “Storylines” as set forth in the NGSS standards. Diablo Highway is a narrative that involves real people with real histories, and it presents these in a narrative-based format to the student. Crime scenes themselves are a type of narrative. To determine the “story of the crime,” students use a sense of place, the crime scene, and then construct the narrative of the crime based on the evidence found at the scene. One could say that it is storytelling using space rather than time as its primary dimension of storytelling. Most narratives are told in time sequence - with a beginning, a middle and an end. In the case of Diablo Highway, time is fixed at a single point – Sunday, April 3rd, 1938 – and space is the primary means of telling the narrative. How is the narrative told? By using the scientific basis of phenomenon in order to reconstruct the events that took place and the people who may have been responsible for those events. So, Diablo Highway is not just a series of lessons, it’s an opportunity for the student’s own curiosity and ingenuity to 'build a case' as to who may have committed the crime, very much like an actual forensics investigator. In Diablo Highway, students are prompted to build their case based on their own investigation or that of their group in a coherent series of labs. Their determination will be based on sound science supported by accurate data as they work their way through the lessons and labs. It is the coherence of the student’s storyline that supports the NGSS standards, an evidence-based lab activity that arises from a student’s interaction with the phenomenon, not the instructor’s. The NGSS recognizes the connection between mathematics and science. Reason abstractly and quantitatively - The entire Case History: Diablo Highway activity is an exercise in abstract reasoning, in the sense that the students are challenged to investigate a time from before they were born (1938), a place that few have seen (the West Texas desert), people they’ve never met (the victims and the suspects), and events they are challenged to interpret. Quantitative reason is applied particularly through the gathering of the evidence from the crime scene, its analysis in the lab activities, and the interpretation of the data generated through these functions. Model with mathematics - In the Case History: Diablo Highway Crime Scene Mapping Lab, students must measure three-dimensional space and create an accurate model to represent the two crime scenes. Use appropriate tools strategically - Conducting the labs, students use a variety of tools: microscopes, calipers, rulers, protractors, forceps, and a variety of digital tools as well, including digital microscopes, digital calipers and digital data recording devices. These tools are used strategically throughout the conduct of the various lab activities as they lead through the comprehensive investigation of the crime. In supporting the NGSS, Diablo Highway therefore also supports these CCSS standards in literacy. Diablo Highway: Firearms Identification lab provides primary written documents as an important basis for the understanding of the crime narrative upon which the science is based. These include source documents such as newspaper articles about the crime, trial depositions and written documents used as evidence in the trial itself. Furthermore, as a culminating project at the end of the activity, students are asked to write a short report summarizing their determinations. This report must include their determinations supported coherently by evidence and the data from their lab reports in an articulate demonstration of their mastery of these science concepts.